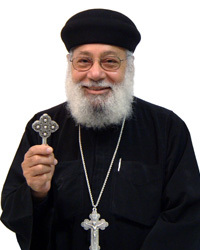 Father Angelos Youssef was born on July 2, 1929. He earned an MBA degree in Accounting and a CPA designation. He served as Treasurer and member of the Board of Deacons of Holy Virgin Mary Church in Los Angeles, California for many years since her inception. He was ordained Deacon Stephen by His Grace Bishop Serapion on August 30, 1998, and was promoted to the rank of Archdeacon on October 23, 1998. On May 23, 1999, His Grace Bishop Serapion ordained Archdeacon Stephen as a general priest. Father Angelos served primarily at Holy Virgin Mary Church in Los Angeles, and also served other churches of the Diocese including Saint Mary Magdalene, Palm Springs and Saint John the Baptist, Oxnard. Father Angelos served Saint Mark Church in Honolulu, Hawaii from 2002 to 2006. During that time he earned a Masters Degree in Pastoral Theology from Chaminade University. He was a co-servant at Holy Virgin Mary Church, Los Angeles and assisted in the financial matters of the Diocese and her churches until he reposed in the Lord on June 30, 2012.